PARK (GR 025673) Close to the New Inn and beside the water troughs find a suitable space for a couple of cars in the midst of Flash. 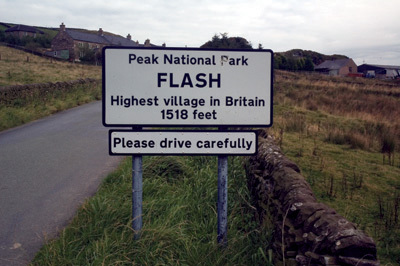 The civil parish of Quarnford, is nucleated upon the community of Flash, the highest Staffordshire Moorland village, boldly affirmed by the inn-sign, which states it to be the highest village pub in British Isles at 1518ft. 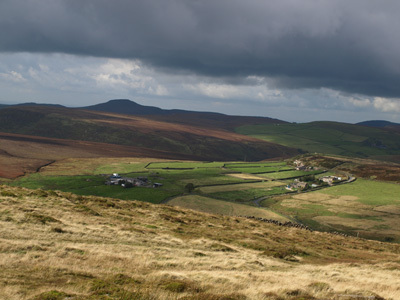 The walk strolls over Wolf Edge and steps off the high gritstone slope of Axe Edge to discover the secret wilds of the youthful Dove. 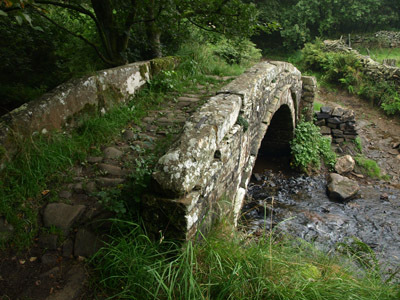 In common with Walk 13 the focus is beautiful Washgate Bridge, from where the expedition climbs back over Colshaw to inspect the first ‘fold’ of the stripling Manifold. Walk west from the New Inn passing the decaying Weslyan Chapel, a imposing tall square hall of a building with first floor steps, being an early Victorian rebuild from a late eighteenth-century chapel, it proclaims “The Lord loveth the gates of Zion’. The promised land in our case lies over the hill, so let’s be gone. Pass up by the old Smithy and bear right up the track, keep left and a weather eye out for a nippy dog (advice: don’t turn your back to it, i.e. walk backwards if you have to and through the gate). With an inviting lane leading on opening to a grand prospect towards Shutlingslow, ignore, instead heed the footpath sign directing right up the field. This path leads via wall-stiles back into the lane further on with the rocks of Wolf Edge forming a skyline feature ahead. Negotiating muddy patches clamber over a fence stile in marshy ground advancing to where a short walled lane branches left. You may choose to follow this, via the gate, to visit the outcrop of Wolf Edge. 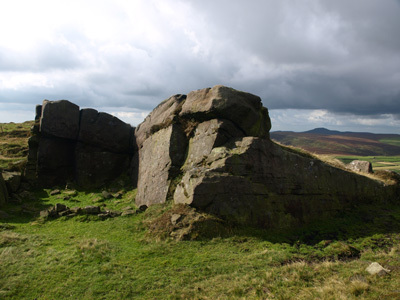 This is an excellent early excuse to stop and admire the great expansive landscape of the Staffordshire Moorlands, its character is nowhere better displayed. One must deduce the location held folk connection with a breeding place of the wolf - a quick flash back to that recent nipping dog! Backtrack and follow the footpath heading on north waymark posts ensure you keep on course beyond a ruin. Spot a caravan and mast on top of Oliver Hill over in view to the right, at 513m/1683ft this is the highest point in Staffordshire. 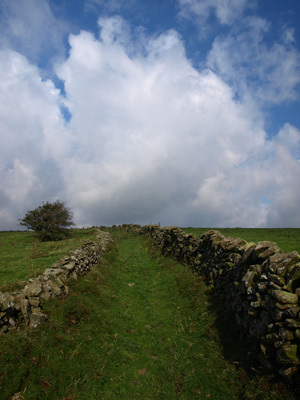 The path descends via three stiles, leading through a strip of improved pasture to the left of Oxenstitch farm to climb up onto the road at a fence stile, substituting the old stone stile above. Turn up right, branching left at the junction rising to Hilltop where bear up left again passing through a cottage row with red private notice to a final cottage. Go through the succeeding gate and follow the gravel track declining gently along the slopes of Axe Edge End. 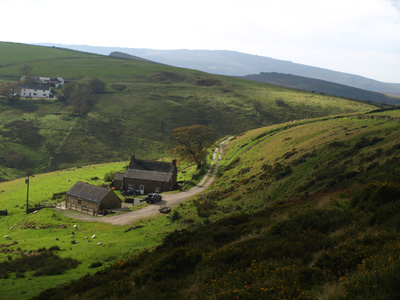 ‘Axe’ is an old term for ‘principal spring’ and directly below is Dove Head Farm, the source of the Dove. After a galvanised gate cautiously cross the A53 - the Travellers Rest advert a bit premature in the context of the walk. Pass down and round to the left of Wallnook, via gates and hand gates to enter a pasture. Go straight downhill with a wall to the right, after a stile becoming a shallow hollow way, after the next stile pass a concrete block pump house. The descending drove way becomes an irregularly walled passage, finally entering a very damp access to wicket-gate onto a metalled lane, beside an upgraded drive to Mount Pleasant. Ascend the roadway ahead passing the tidy entrance to Sycamore Cottage to a road junction, go straight across into the rising green lane, which narrows and turns right at 90-degrees. Descending easily to the former school-house go left onto the road by the letterbox. Turn right, passing the former Brand Top school, now an occasional community hall, with remote telephone kiosk and, a few paces on, a poignant sheltered war memorial. 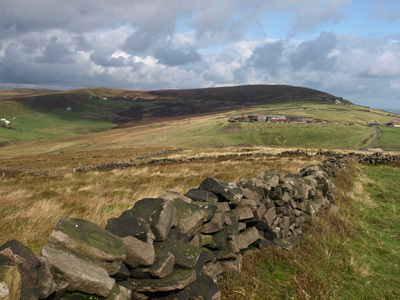 Advance over the cattle grid and pass just beyond the ruined farm with a caravan behind. 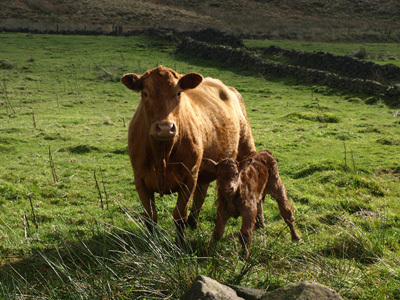 A red footpath sign directs half-right from the fence-lined track, aim downhill to the far corner of the pasture, where a broken-walled passage leads towards a barn, bear half-left to a stile with distinctive tall posts. Cross the stile into the rough valley side below Howe Green. The tangible path largely contours, guided by waymark posts, curiously wrapped in barbed wire! Wading through the bracken come to a stile and keep along the edge to the ridge-end, where meet up with another path and descend the nose of the ridge to a stile and flag bridge over the side stream just before its confluence with the Dove. The path clings to the wooded edge of the dove gorge latterly guided by a fence to a wicket-gate into Washgate Lane. Turn right downhill, with the sadly disturbed cobbling of the ancient track all too evident, the result of ‘for fun’ visitations of off-road vehicles over the last dozen years. 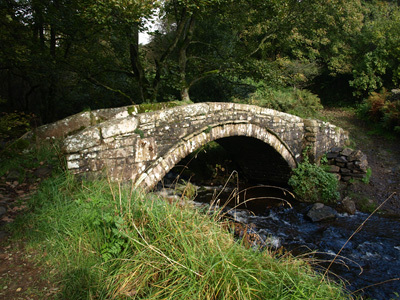 Arriving at the packhorse bridge in September 2008 the stone inserted earlier this year at the start of the ford to block vehicular access was malicious uprooted. The intention of the National Park Authority is to in-instate the cobbling now that the ‘road’ has officially been re-designated a footpath only. 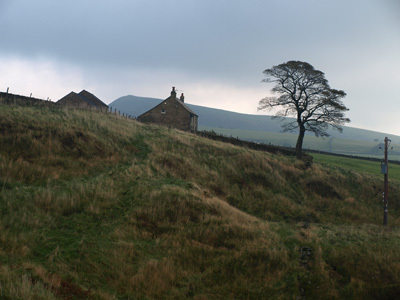 The name Washgate confirms that this was once the site of a sheep-wash, cleaning the wool before shearing ensured a higher price. The ‘way’ immediately on the south side of the bridge turns acutely left, and while the map shows a footpath climbing the steep bank ahead, having explored it, the author can state unequivocally it ain’t worth following! Keep to the packhorse way, avoid fording by keeping tight to the bank. The rock-stepped lane shows more evidence of tyre tread before levelling and capturing rainfall in deep pools. Coming out on the road at Tenterhill Farm a large boulder impedes all bar foot traffic from/to the lane, the apparently temporary road closed sign contradicting the permanent ‘bike and car’ sign, which has yet to be removed. 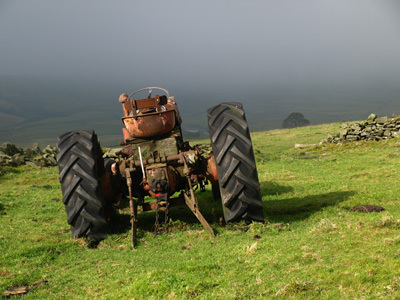 The farm-name comes from the former use of ‘tenter-hooks’, evidently which were once set on frames here to stretch woollen cloth. Follow on up the road to Golling Gate, ‘the road flanked by marsh marigold’. At the junction turn right at the footpath sign, into what becomes a narrow green lane, as it bends left being further compromised by water, looks more like a stream than a path and is quite awkward to dodge. After a hand-gate switch acutely right up to a hand-gate and continue within a sunken lane, walling largely absent on the left, rising to a hand-gate onto the road on Colshaw. Turn left following the road unswervingly to the junction with a rising road. 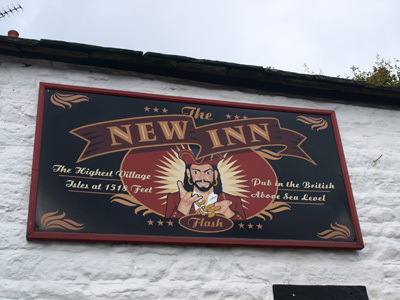 If your thirst and hunger can no more go right to visit Flash Bar (pub and adjacent tearoom). Otherwise, go straight across through the wicket-gate, left of a renovated stone shed. Cross the paddock to go through a second wicket-gate, now bearing half-right over a lost field boundary to a recessed hand-gate with access land sign in the fenced field corner. 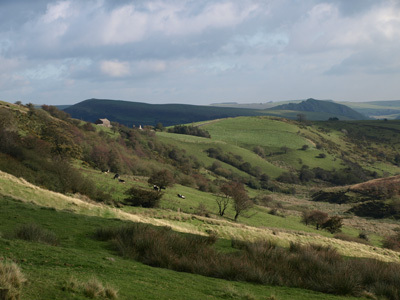 Contour forward along the bank top overlooking the Manifold valley with lovely views back to the upper Dove hills and Hollinsclough Moor. Slipping through light gorse descend on an evident path to the farm track at Nield Bank. Follow the open access track, which duly crosses the youthful Manifold and swerves uphill on tarmac to a cattle grid where once more cross the A53. Two stiles give entry into horse pasture keep the wall close right. Two further wall-stiles lead onto a track and galvanised gate. Keep up to the right of the large barn waymarking guiding through the farm buildings and past a large tanker lorry tank and behind the stone buildings of Northfield Farm in a lane below the churchyard, at the end turn up right to end the walk conveniently at the New Inn door. Flash Bar Shores Tearoom and adjacent Travellers Rest, not forgetting the New Inn in Flash.